Buzz exploring the garden of Andy’s house. Toy Story. A movie and a series that you cannot have seen. And if you haven’t, what are you waiting for?!? Go grab a DVD and watch these awesome cartoons! So what’s this game all about? This game follows the story of the second movie: Woody gets kidnapped by a toy’s collector who wants to display him in a museum along other toys of the old wild west. Of course, Woody’s friends don’t agree with that, and embarch on a quest to find where he was brought and save him before his kidnapper leaves the country with a plane. If that was not enough, Buzz is able to use 5 different powerups which he can find around the levels. Those are the Cosmic Shield, the Rocket Boots, the Hover Boots, the Grappling Hook and the Disk Launcher. The powerups needs to be unlocked first, and since the way to unlock a powerup might not be on the same level where it’s found, you sometimes need to leave a level before completing it, and later return to finish what you left. This is interesting, since the game isn’t linear anymore, but you need to backtrack to previous areas if you want to be done with everything. Slinky offers us a time challenge in which we need to bring him 5 bones before the time runs out. All the levels are basically the same, except level 3,6,9,12 and 15 which are the boss levels. In all the others, Buzz has to find 5 Pizza Planet Tokens. Those are needed to unlock the next levels. You don’t need them all (sometimes you might miss a powerup to get a token) but the more you get the better. The Coins token: There are coins scattered around the area. Collect 50 of them and then talk to Hamm somewhere in the level. The Miniboss token: Somewhere in the level, a miniboss wants to challenge you. Defeat it to get this token. The collection token: In every level there are 5 hidden objects that you need to bring back to someone. In the first level for example, those objects are the sheeps of Bo-Beep. The challenge token: Somewhere in the level, you will be offered a time challenge. Win it to claim the token. The Puzzle token: somewhere in the level there will be a puzzle for you to solve. Solve it to get the token. In any case, this game is sure to be fun to play. It is very short, indeed, but it is good for casual gamers who play from time to time and want a simple and quick game with a fair progression of difficulty. The controls are also very easy to understand and so far I have seen no flaws whatsoever. 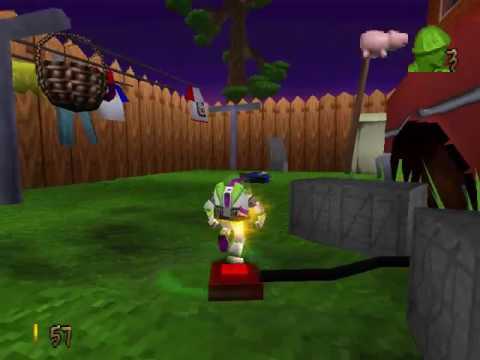 Have a go at Toy Story 2: Buzz Lightyear to the rescue for the Playstation. You won’t regret it. 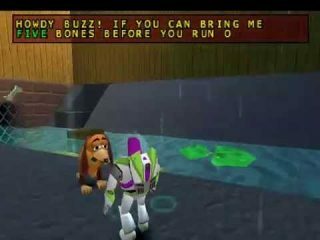 A note on the Let’s Play: the game contains several clips from the Pixar movie “Toy Story 2: Buzz Lightyear to the rescue”. Those clips have been skipped throughout all the let’s play.